Looks can be deceiving. 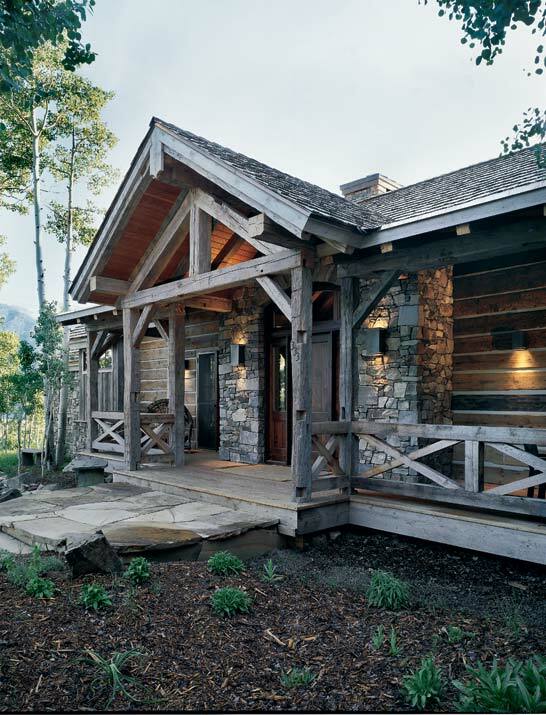 Nestled in the heart of the Rockies, a rustic post-and-beam timber home that appears centuries old actually is on the cutting edge of design. Unconvinced? It’s true: Under that distressed exterior lies a structure built using as many recycled materials as possible. Considering the home was built years before the current “green” movement, you could say that this old-fashioned house was ahead of its time. And the stunning result has left residents in the popular skiing resort-town of Crested Butte, Colorado, scrambling to re-create the old-is-new-again approach for their own homes. Unfortunately (or fortunately, depending on your outlook), this house is one-of-a-kind, explains Sara Potoker, owner of Ansley Interiors and the interior decorator of the jaw-dropping timber home. First and foremost, the home’s design was focused on the unique, finely aged timbers reclaimed from barns in Northeast, according to the home’s architect, Dan Murphy. “Working with those timbers was really wonderful,” Sara recalls. “The timbers are really the artwork in the house.” But they required a little bit of sweat equity to really shine. In order to smooth away splinters while maintaining the antique wood’s sumptuous patina, Sara and her team relied on some good old-fashioned elbow grease to hand wax all of the beams. “The timbers just call out to you,” Sara says. “But the lengths and widths were inconsistent, so making them work within the design was difficult.” Dan certainly agrees, noting, “The joinery was quite a challenge in this home. We had mortise and tenons throughout the timbers from the old structures. In some places, we had to bolt the timbers together to create structural beams,” recalls Dan. But Dan’s efforts were well spent, resulting in a 5,500-square-foot home that’s both elegant and comfortable. The rambling layout takes advantage of the lot, which is long and shallow. When the homeowners asked for a place that entertained well, Dan devised a combined great room, dining area and kitchen to open up the main level, using gorgeous and structural timber beams instead of walls to divide up the space. To provide privacy for the both the residents and the lucky visitors who frequent the home, the master suite and guest rooms flank the central living area. That layout also allows for most of the rooms to have access to porches and decks to take in the stunning mountainside tableau, which made a huge impact on the design of the home. “You walk into the house and the first thing that grabs your eye is the amazing view,” says Sara. Multiple sitting areas were created throughout the main level so revelers could socialize and still drink in the mountain scenery through the huge arched picture windows. And while you might think that such an expansive stretch of glass would make window treatments nearly impossible, those recycled timbers serve another purpose: They hide the window shade and its apparatus when it’s not in use.